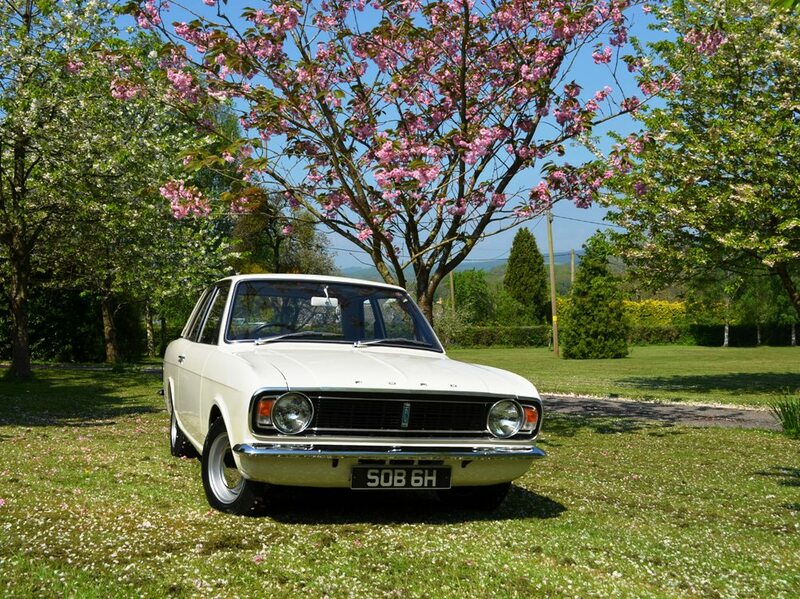 Like me, Will started off with a Series 2 car in the 1970s, and has always had a soft spot for these cars. He’s been after this one for a couple of years, and I can see why. 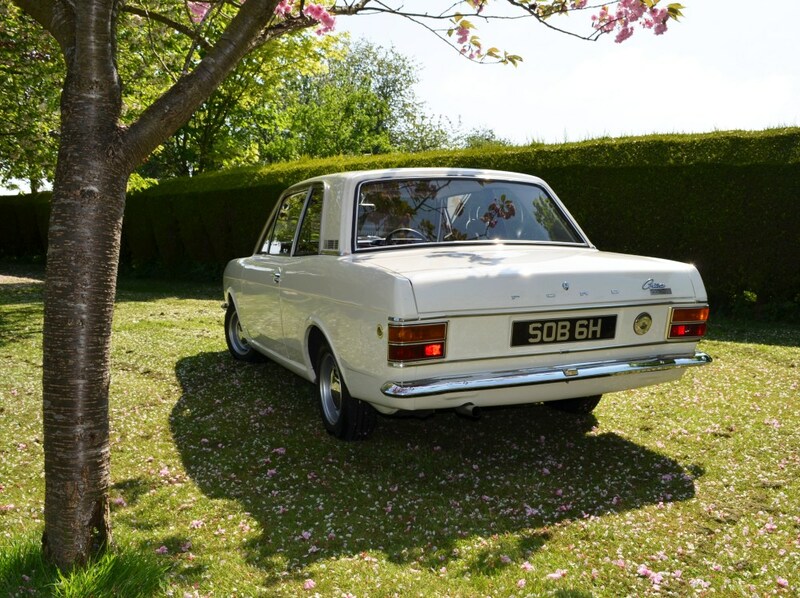 This is one of the most perfectly restored Series 2 cars I’ve seen, and the attention to detail, especially with the bodywork clearances and swage-lines, is just stunning. 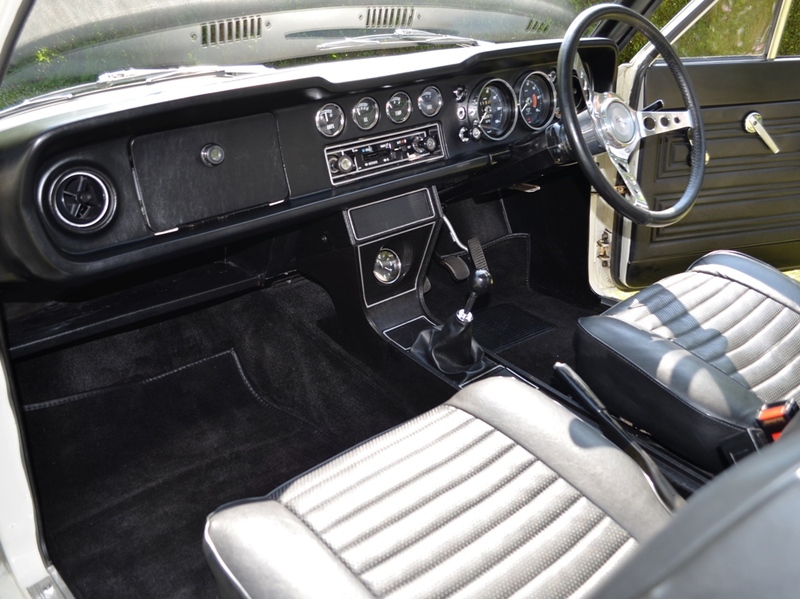 What is even more impressive is that John, who owned and restored the car, doesn’t do this for a living, and completed the metalwork in his garage. Over a 5 year period! 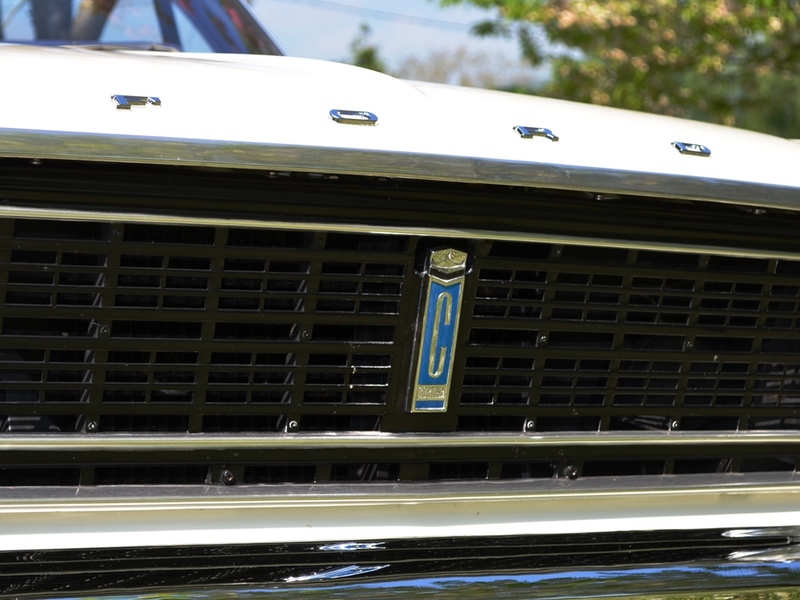 This section shows the car in detail, with a couple of glamour shots up front because the car looks so good. 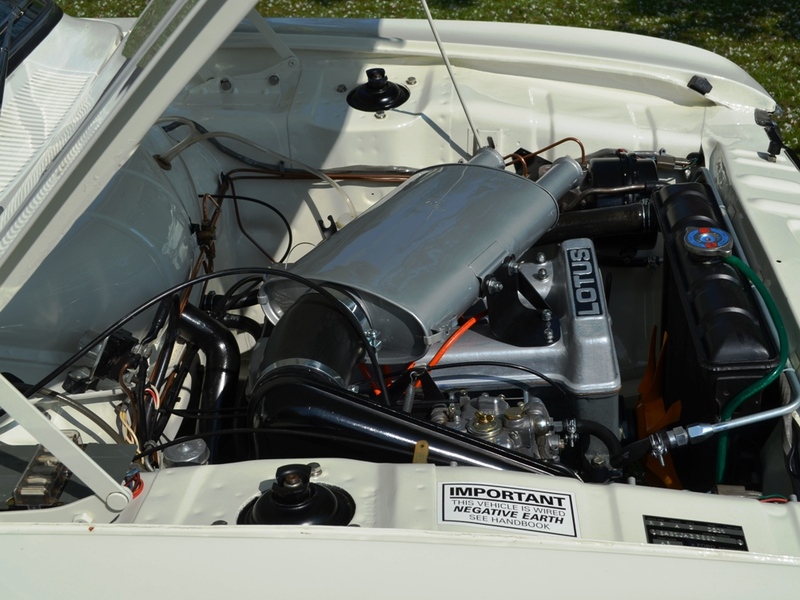 As shown the car is as John restored it and as Will bought it. Since these photos have been taken Will has had the green stripes added, and I will add some photos of the car with stripe in due course. 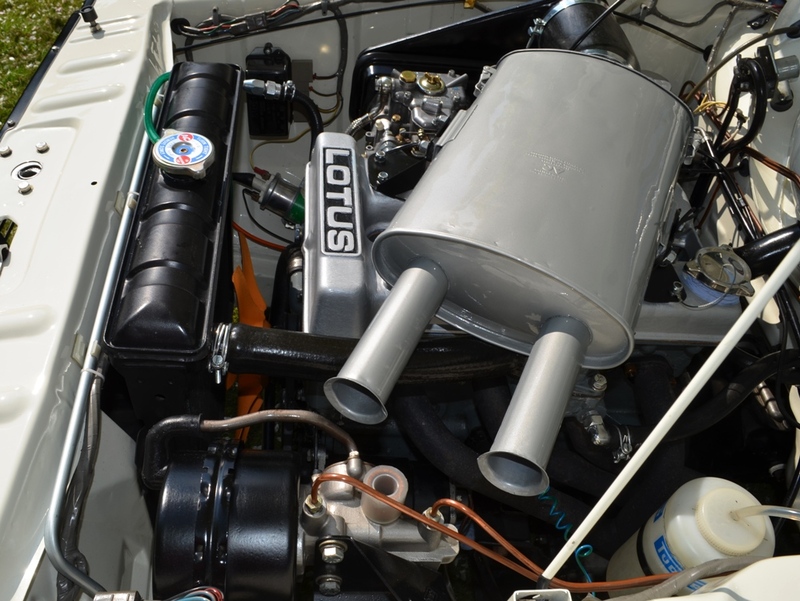 There is also a large collection of restoration photographs of SOB which will also be loaded up in the Buying / Restoring / Running section, and they cannot fail to impress with the obvious skills applied and dedication to getting it absolutely right. Looking at a bit more detail. 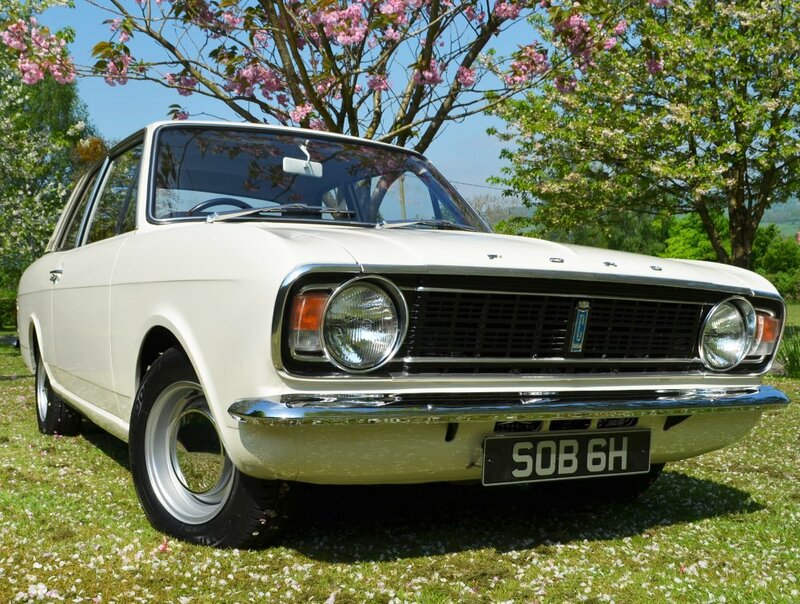 the Series 2 changes at the front are quite small, with the F O R D letters across the bonnet, and the blue ‘C’ (Cortina) badge in the centre of the grill. 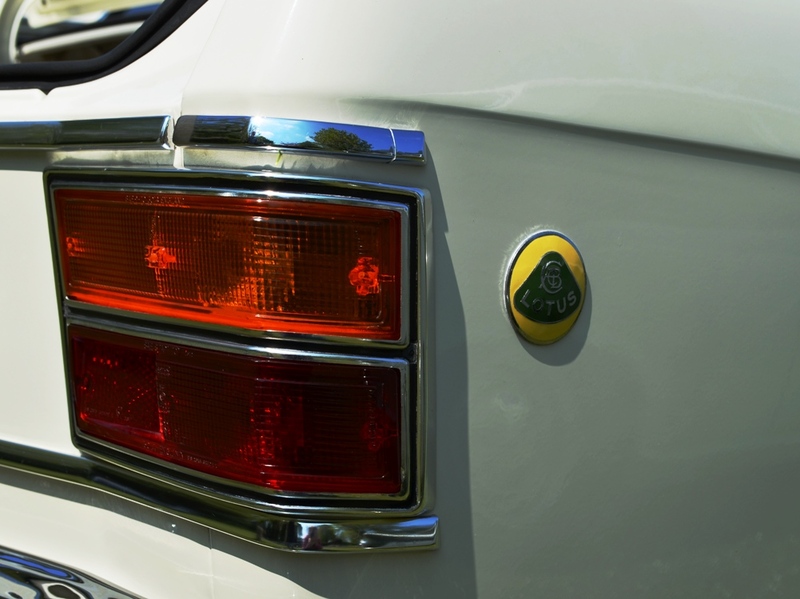 That is now only a badge, as the top of the red badge of the Series 1 was the push button to open the bonnet. 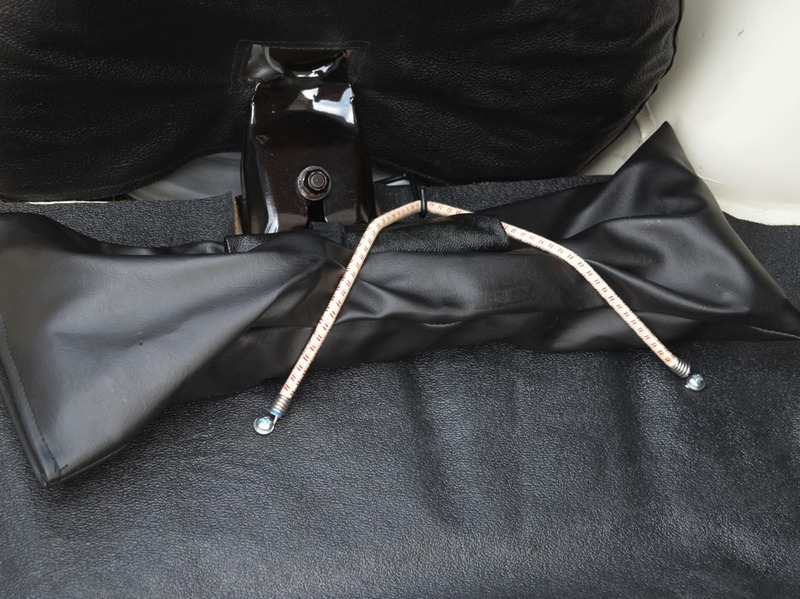 The Series 2 bonnet is opened by a cable pull inside the car. 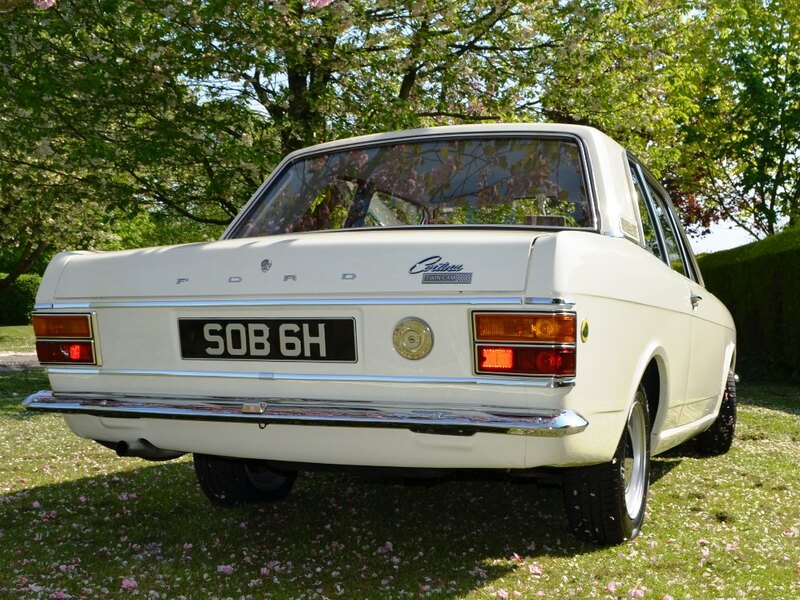 Again, quite small changes at the rear, with the F O R D badges on the boot, and the chrome trim running horizontally across the back of the car. 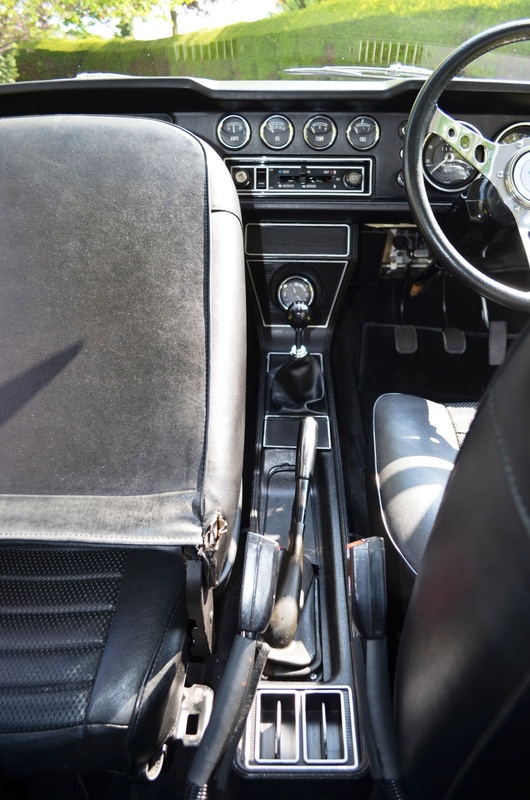 The interior of the Series 2 is very different to the Series 1 cars. 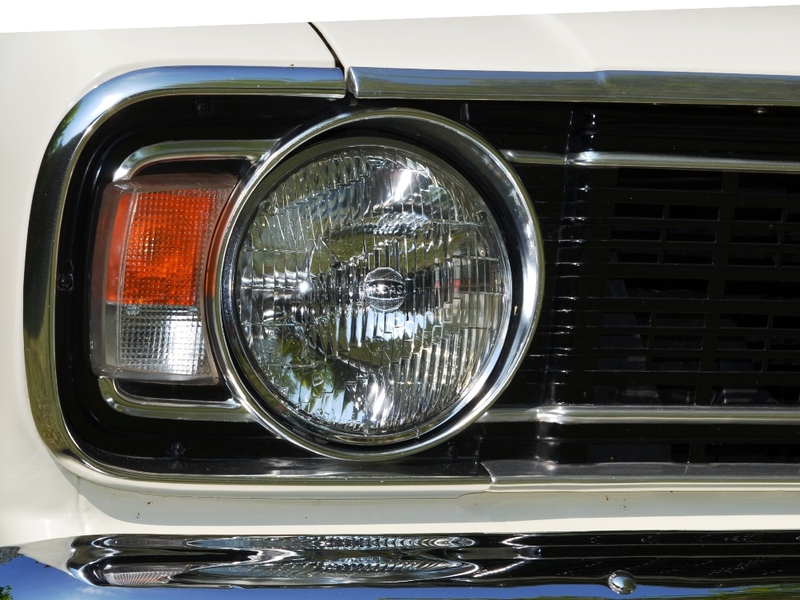 Like the Series 1, it is based on the GT. 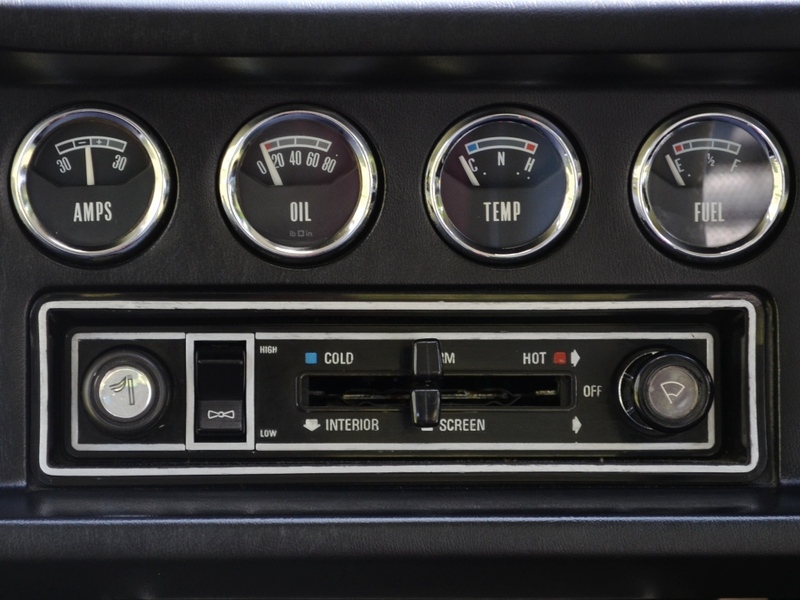 It now has the minor gauges set into the dashboard rather than in a pod on top of the dash, and at last, the under-dash handbrake has gone, replaced by a more conventional handbrake mounted within a new centre console. 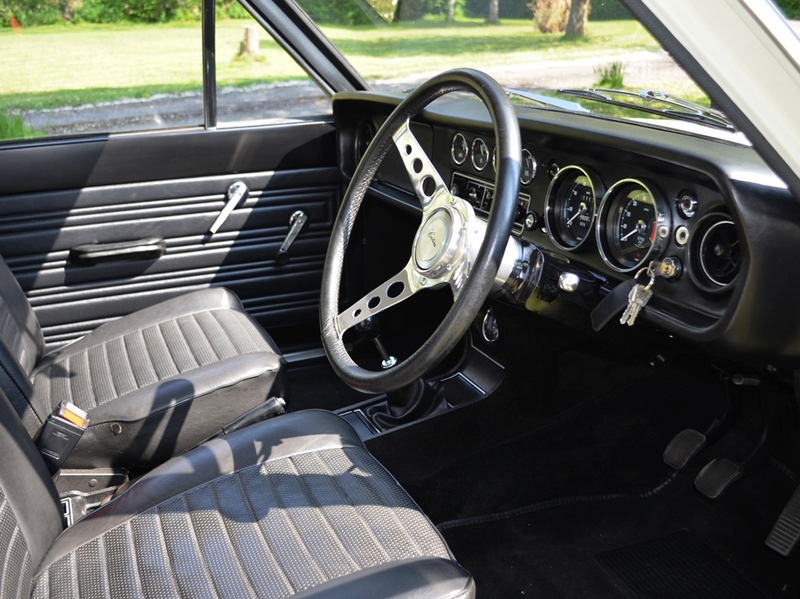 As for the later Series 1 cars, the 1600E steering wheel is used, but this is different to the Series 1 wheel having a longer boss. 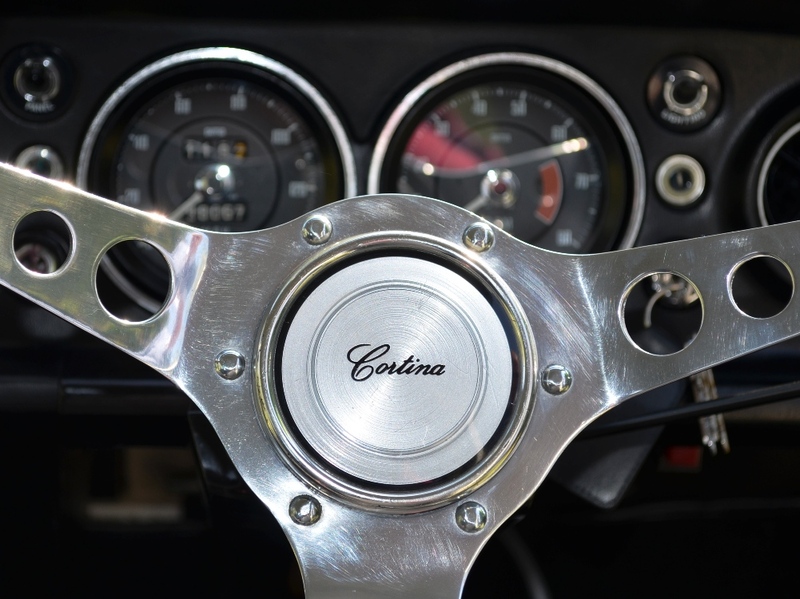 The steering wheel was always riveted to the boss, and the centre badge is from the standard Cortina steering wheel . 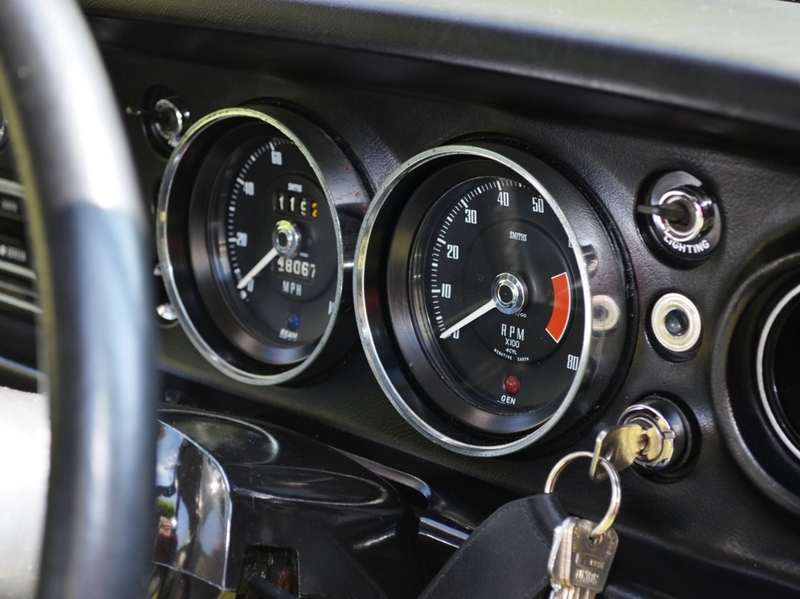 The main differences from the GT instruments are the 6000 rpm – 8000 rpm redline tachometer and the 140mph speedometer, both with satin black bezels. 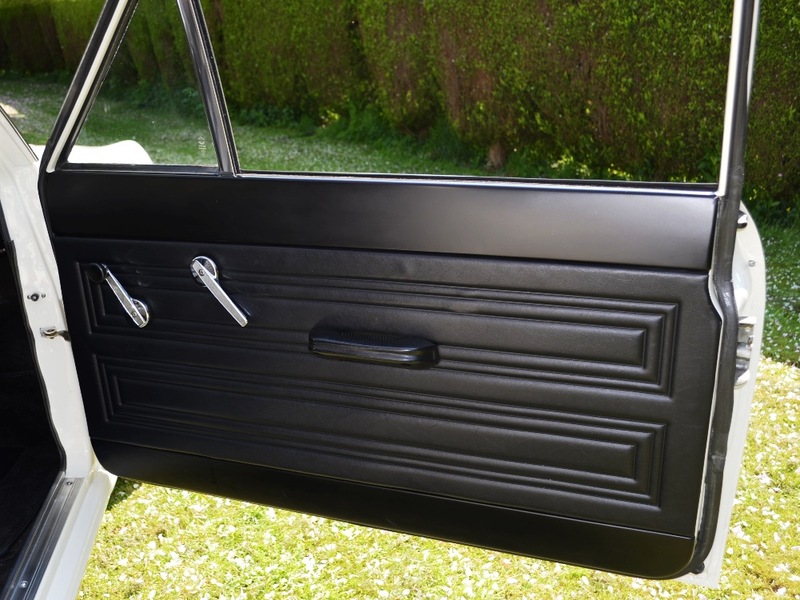 These instruments are set in the standard chromed plastic surrounds of the standard Cortina. 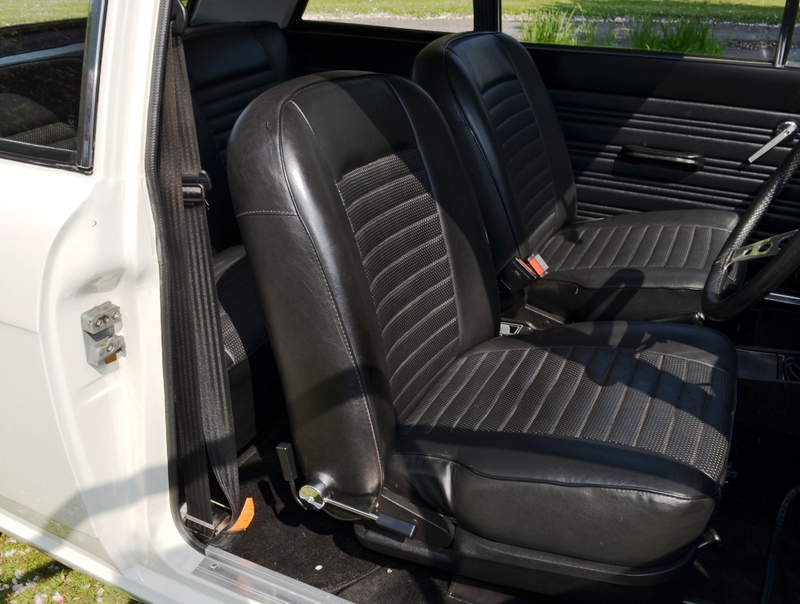 The upholstery is a new design for the Series 2 car, with the basket weave inserts. 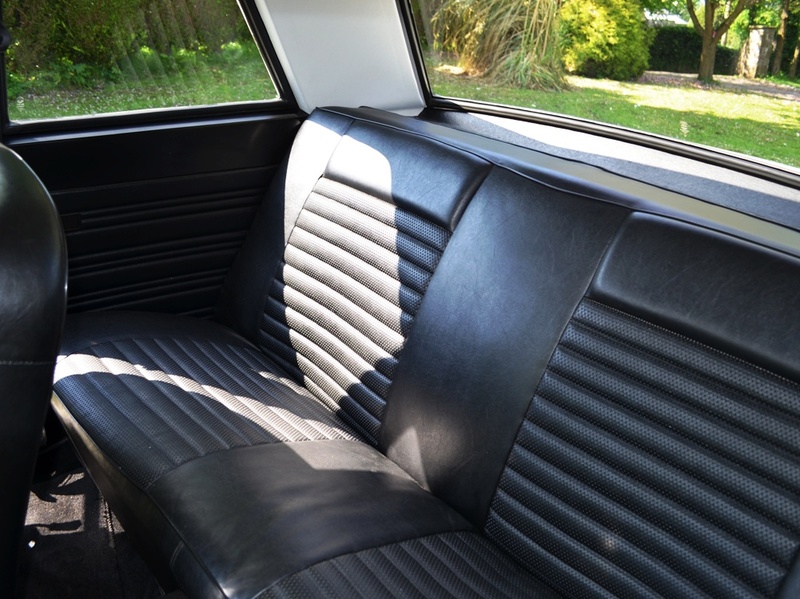 Note that this car is fitted with the rare recline seats, which actually make the drive comfortable! 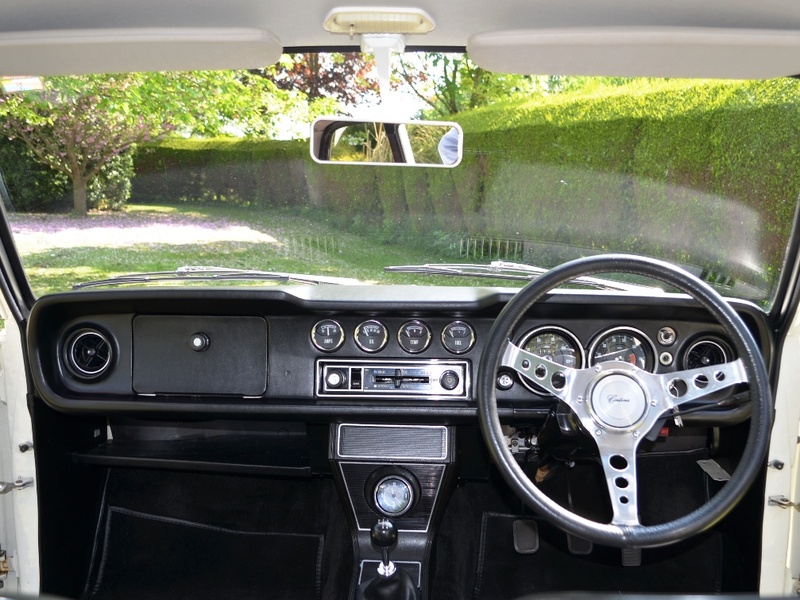 The metalwork inside the Lotus Cortina was satin black in the white cars when the interior was black, but could be body coloured in the non-white cars or when the interior was not black. Lack of rubber strip along back of plenum. 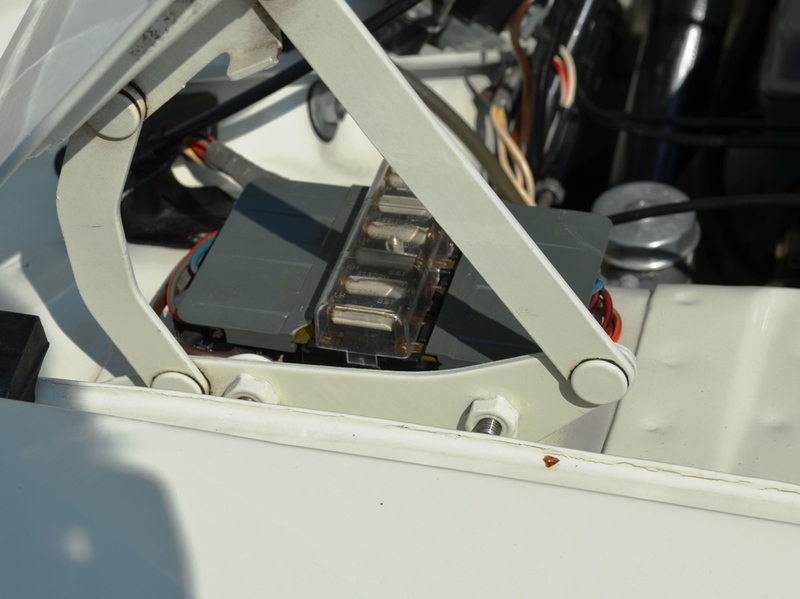 Note the position of the voltage regulator on the offside inner wing for the Series 2. 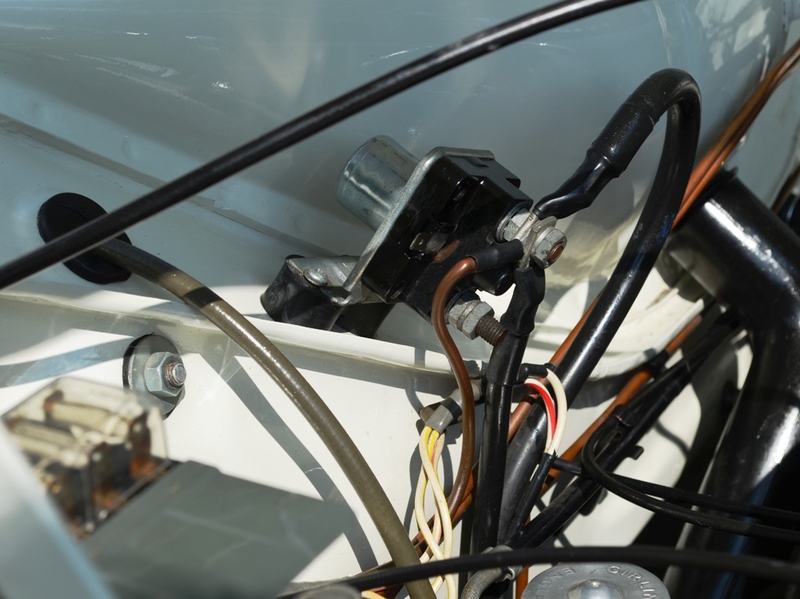 This location, and the wiring loom, are unique to Lotus Cortinas. 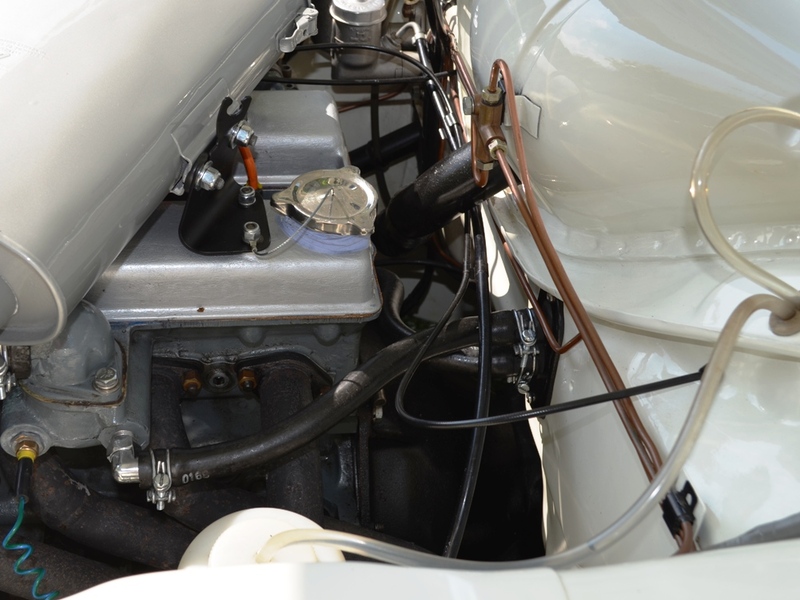 The regulator can be missing if the engine has been converted to alternator, but you should still see the loom tails in the right place. 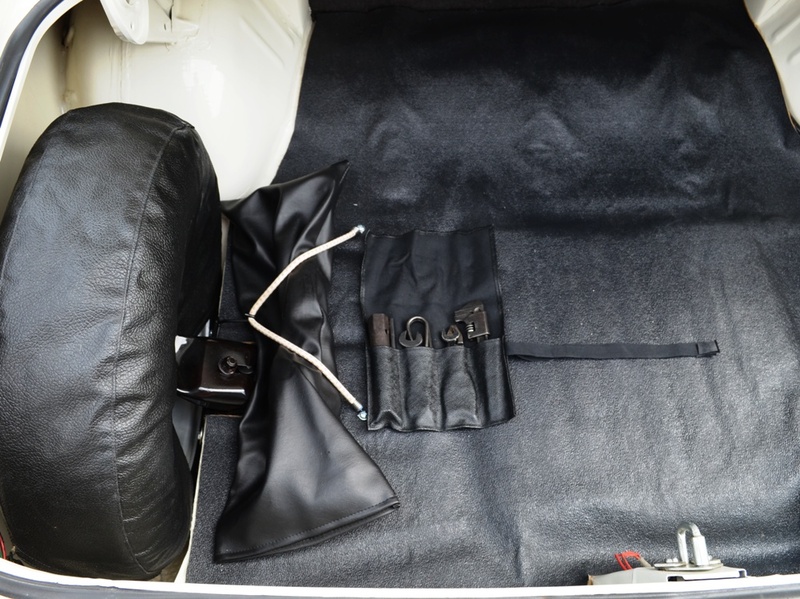 The washer bottle is not the original type on this car, but Will is tracking one down! 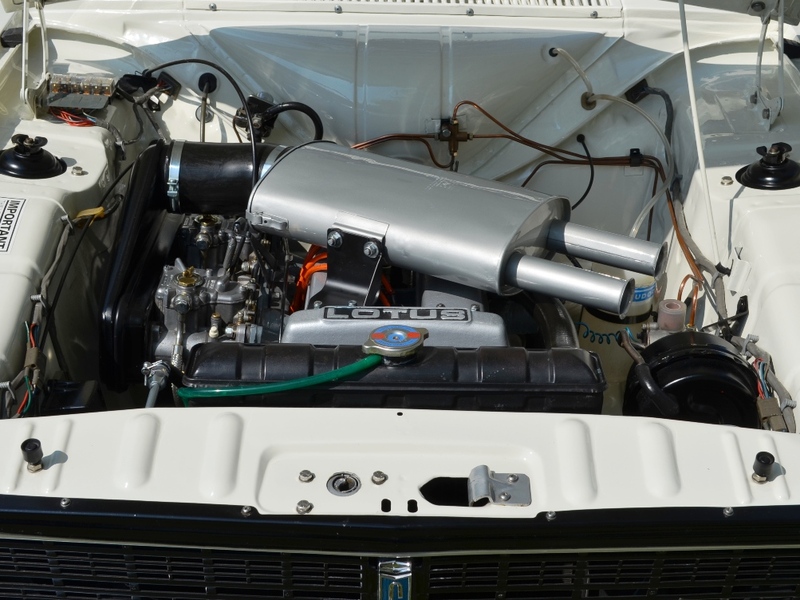 The washer bottle and cage was the same on all Mk2 Lotus Cortinas. See the Series 1a study for a photograph. 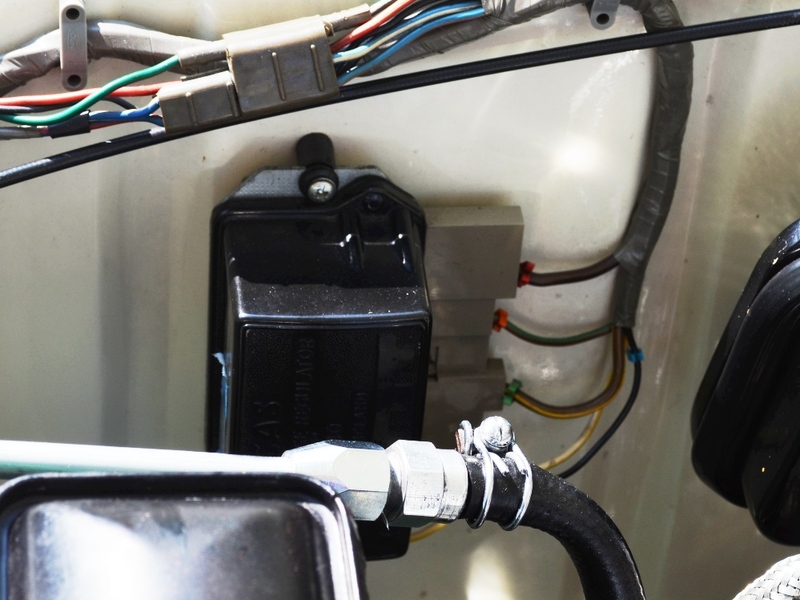 Note the bungee cord holding the toolkit to the floor, in conjunction with the hook that is mounted in the spare wheel well. 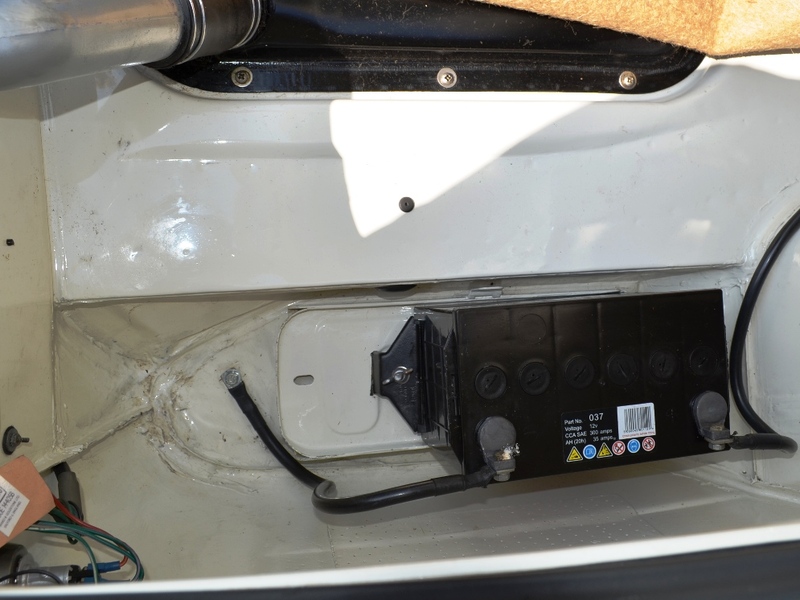 The battery is held in with the bottom bracket only with the Series 2 cars, rather than the ‘cage’ fitted to the earlier cars. 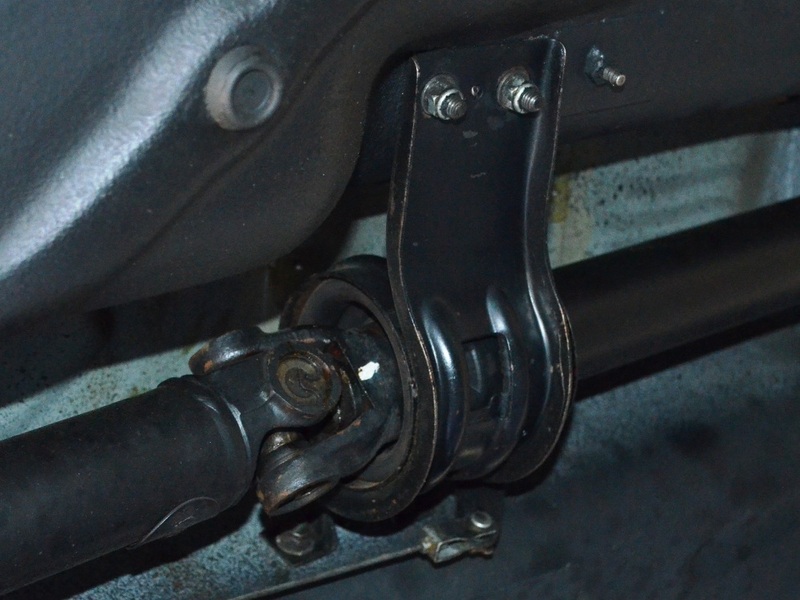 The split propshaft was re-designed for the Series 2 cars, with a totally different centre bearing and mounting bracket. 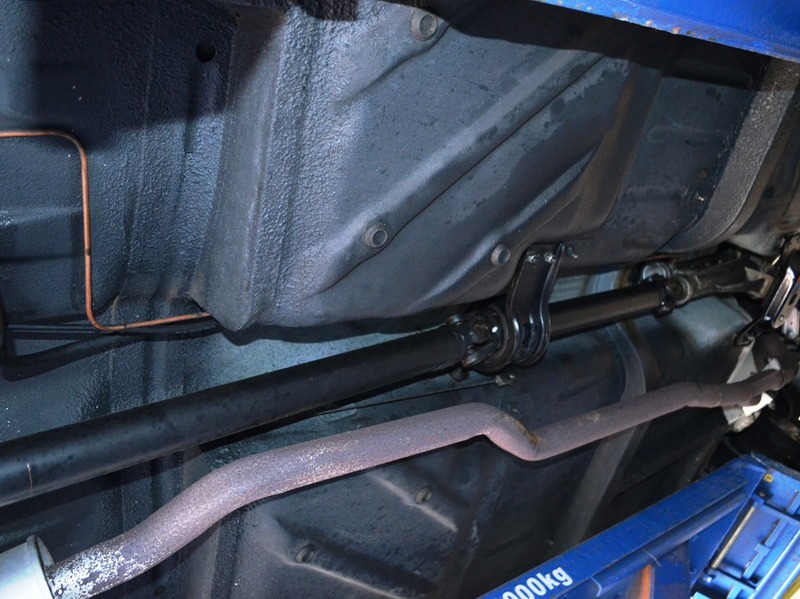 All Mk2 Lotus Cortinas had a split propshaft.